FREMONT, Calif., Feb. 6, 2019 /PRNewswire/ -- Excelfore, an enabler of smart mobility networks, announces a working Time Aware Shaper (TAS) for Ethernet TSN networks. As in-vehicle networking continues to grow in importance, Ethernet is becoming an increasingly popular platform providing secure, high-speed, inexpensive solutions. To meet automotive requirements for deterministic network behavior, new protocols must be added onto Ethernet stacks to provide Audio/Video Bridging (AVB) and Time Sensitive Networking (TSN) These new protocols enable Ethernet to meet the demands of in-vehicle infotainment, control and safety systems. The Excelfore TAS protocols reside in network talkers and bridges with support for TSN enhancements including IEEE 802.1Qbv and 802.1Qci. The TAS provides a circuit-switched/ Time-Division-Multiplexed (TDM) channel into the otherwise packet-based Ethernet network. This enables a specific time window to be guaranteed for the delivery of high priority traffic, for example for automotive control systems. The Excelfore TAS has demonstrated the ability to reduce the variance in measured propagation delays by more than 65% compared to Ethernet traffic without the TAS, ensuring deterministc sub-100 microsecond accuracy for time-sensitive traffic. Shrikant Acharya, CTO at Excelfore, said, "Excelfore has consistently played a leading role in Ethernet AVB/TSN implementations. Last year we presented the first working demonstration of IEEE 802.1ASrev grand master clock redundancy. In 2016 our AVB protocol stack was the first to be certified by the Avnu Alliance for both the talker and listener functions." The Excelfore eAVB/TSN protocol stack, including the new TAS, is available for Linux, QNX, Integrity and Android operating systems, as well as a variety of smaller RTOSs (real-time operating systems). It is already running in cameras, video displays, head units, ECUs, and network gateways that bridge to CAN, LIN, and other popular automotive busses. 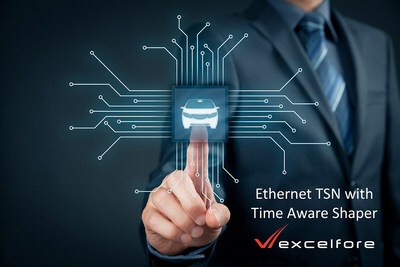 Excelfore will demonstrate its market-leading in-vehicle networking solutions including the Time Aware Shaper at the Automotive Ethernet Congress, February 13-14 in Munich, Germany. Shrikant Acharya, CTO at Excelfore, will be present a session entitled "Implementation of a TSN Time Aware Shaper", at 12:00 on February 14. The presentation describes Excelfore's implementation of a TAS on an automotive-grade Ethernet network switch IC, including presentation of data from extensive testing of differing use cases and network configurations. Excelfore, located in Silicon Valley, is an innovative provider of cloud platform and connectivity applications for intelligent transportation. It provides middleware solutions for smart mobility networks that enable OEMs and suppliers to build the next generation of smart, autonomous and learning vehicles, fleets and associated infrastructure. Excelfore products include the eAVB/TSN™ protocol stack for in-vehicle Ethernet time-sensitive networking, as well as the cloud-to-vehicle eSync™ system for OTA updates, diagnostics and telematics. Excelfore is a registered trademark of Excelfore Corporation.